� gend handed down for more than 1,400 years refer to this ancient town as Hariphunchai. Its first ruler was Queen Chamthewi who was of Mon extraction. 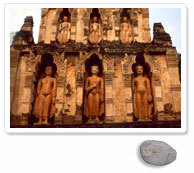 In late 12th century, King Mengrai overran the town and subsequently integrated it into the Lanna Kingdom. From Bangkok, take Highway No. 1 to Nakhon Sawan via Sing Buri and Chai Nat, then turn into Highway No. 11 and proceed to Lamphun, a total distance of 670 kilometres. Trains leave Bangkok’s Hua Lamphong Raialway Station every day. Call 1690 for more information. Visitors can fly from Bangkok to Chiang Mai and then connect a Chiang Mai-Lamphun bus which leave Chang Phueak Bus Station every 15 minutes. Travelling time from Chiang Mai to Lamphun is 45 minutes. Located on Inthayongyot Road almost opposite Wat Phra That Hariphunchai is the Hariphunchai National Museum. Displays and exhibits include historical development and archaeological items found in Lamphun. These include prehistorical human skeletons and objects of arts from the Dvaravati, Hariphunchai, Lanna and Rattanakosin periods. A chamber in devoted to a collection of inscription stones in Mon and Lanna scripts. Another displays ancient utensils, Lanna indigenous arts and carvings. The museum is open on Wednesday-Sunday from 8.30 a.m. to 4.00 p.m.. The admission is 100 baht. Sited in mid-town, Wat Phra That Hariphunchai was built during the reign of King Arthitayarat, a descendant of Queen Chamthewi some 800 years ago. A principal landmark is the 46-metre tall golden Chedi whose present appearance was the result of the restoration work in 1443 by a king of Chiang Mai. It has long been regarded as a major place of worship. Other architectural works include the ancient-style brick arch adorned with fine designs and the pair of sculptured lions at the door. There are also a square-shaped Chedi and a Khmer-style Buddha statue. It is open at 6 a.m.-6 p.m. The entrance fee is 20 baht. Visit www.hariphunchaitemple.org for more information. Another ancient site related to the old history of the town is Wat Phra Yuen. The Ku Chang-Ku Ma Chedi at the temple is surrounded on four directions by standing statues. The Chedi itself is cylinder-shaped and commemorates Queen Chamthewi's war elephant and her son's steed. Wat Chamthewi, commonly referred to a “Ku Kut”, is located on the Lamphun-San Pa Tong Road and built in 1298 B.E. in the Lawo (Lopburi) style. The Chedi is a square structure similar to Buddhagaya in India. Around the Chedi are levels of arches holding a total of 60 Buddha statues. Ashes of the queen are enshrined within the Chedi. The Phra Nang Chamthewi Statue is located in the Nong Dok public park in town commemorating the first ruler of Hariphunchai. Ban Hong is the site of a 1,400-year-old community dating back to the Hariphunchai Kingdom. Located some 40 kilometres to the south of Lamphun, it offers a scenic and delightful vista of green fields and mountains. It also has several old temples built in admirable indigenous style, e.g., Wat Phra Chao Ton Luang with its 600-year-old Buddha statue, Wat Pa Puai and Wat Dong Rusi. The later two temples both maintain 100-year-old Ho Trai (scripture halls) built with wood in delicate patterns. Some of the natural attractions in the district include Tham Luang Pha Wiang, a cave some 15 kilometres south of the district town. Inside the cavern are oddly-shaped stalactites. There are accommodation facilities for tourists in the district town. The Khun Than mountain range of the Doi Khun Than National Park forms a natural boundary between Lamphun and Lampang provinces. The northern rail line to Chiang Mai runs through the longest rail tunnel in the country, which is 1,352 metres long and takes five minutes to traverse. The moutain has both virgin jungle and pinery. The admission is 100 baht for adults and 50 baht for children. About 7 kilometres away on the route to Li district is Wat Phra Phutthabat Tak Pha. Legend has it that the Lord Buddha once stayed here, leaving a trace of likeness of monk's saffron robe and his footprint of stone ground. Pa Sang district is a handicraft centre and famous for its handmade cotton materials which are produced mainly in Ban Nong Nguak. Also at this village is an ancient temple noted for its beautiful arches in indigenous Burmese-influenced style. Located in Tambon Nai Mueang, Amphoe Mueang Lamphun, on the road parallel to the old city wall to the west of town is Wat Mahawan, an old temple built since the times of Queen Chamthewi. Enshrined here is a Nak Prok statue (statue with mythical serphants overhead) which was brought to the temple by the Queen. Commonly known as Phra Rot Lamphun, it serves as the model for the famous votive tablet. The Ban Nong Chang Khuen is the most famous longan growing area in the country. The orchards are located some 8 kilometres before Lamphun and with a further 7 kilometres after a right turn. On both sides of the road are numerous longan orchards. The fruits are in season during July-August. Longans were introduced to the area during the reign of King Rama V and have since spread into neighbouring provinces. There are several species today which are popular among consumers. Covering an area of over 1,000 square kilometres is the Mae Ping National Park. Its main feature is the Ping River, which flows through the forests in the park. On both sides are fertile forest-lands with sheer cliffs providing beautiful natural scenery. Certain parts of the waterway spread out to form reservoir-like bodies of water with numerous small islands and rapids. Another attraction is the 7-level Ko Luang Waterfall, which is fed from lime streams. It is just 20 kilometres from the park headquarters and accessible by road. Fascinating stalactites and stalagmites are to be found inside nearby lime caves. The admission is 100 baht for adults and 50 baht for children. Tourists wishing to stay overnight are recommended to contact park headquarters at Tel. 0 2562 0760, www.dnp.go.th, or Mae Ping National Park office which is located some 20 kilometres off Highway No.106 at Km.47. In front of the Town Hall is the Suthewa Rusi Statue. Legend has it that the Rusi, or ascetic, was the actual founder of Hariphunchai. As an ascetic refraining from worldly affairs he invited Phra Nang Chamthevi, a daughter of the King of Lopburi, to ascend the throne and helped her to firmly establish Buddhism in the land.